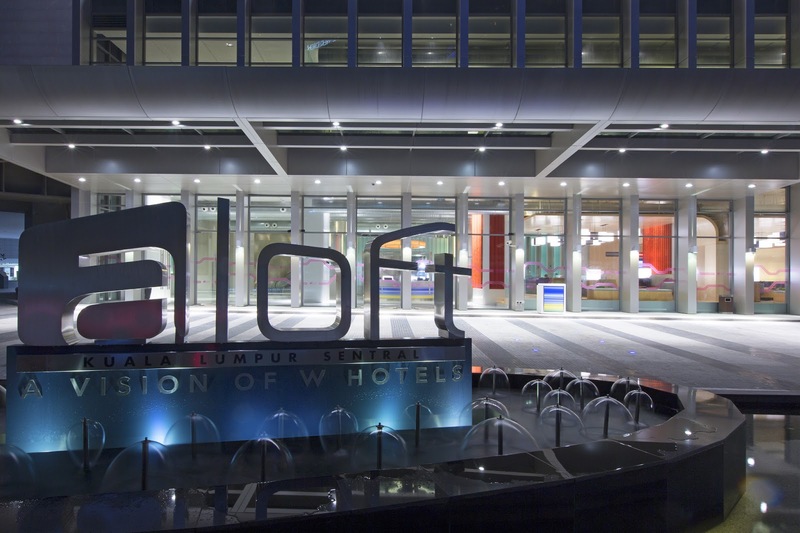 Believe it or not, the world's biggest Aloft Hotel is now opened in KL! 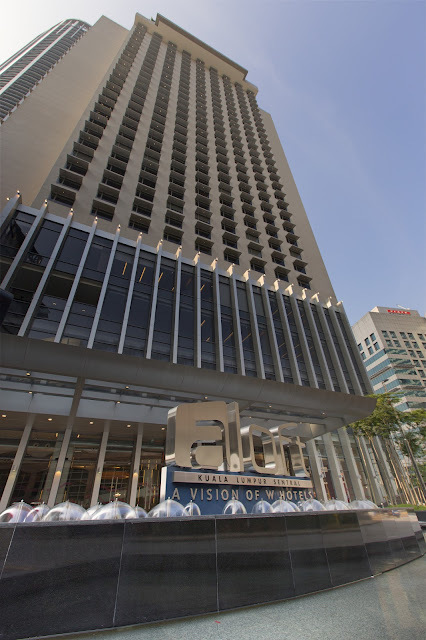 I was one of the lucky invitees to witness the official opening of this latest Starwood property - the 11th Aloft property in the region. Amidst prancing "lions" that climbed poles and performed death-defying stunts accompanied by clashing cymbals and thunderous drum beats, the owners and directors of Aloft KL beamed proudly as the media snapped away at the auspicious occasion. Industrial finishing with protruding and exposed air ducts, raw concrete walls and neon colours abound within the lobby. A circular Aloha Desk (bye bye boring reception desk) welcomes check-ins whilst the trendily furnished "re:mix" lounge invites you to burrow into the plush sofas and armchairs littered with furry thrown cushions. When was the last time you find a pool table right smack in a corner of the lobby? So far I've only seen one in Hard Rock Hotel Pattaya but it's a first here in KL. Go on, make yourself at home in Aloft...shoot some pool, have a drink, mix and mingle or get your creative juices flowing at "w xyz" bar - the mixology hot spot that's similar yet different from your average watering hole. 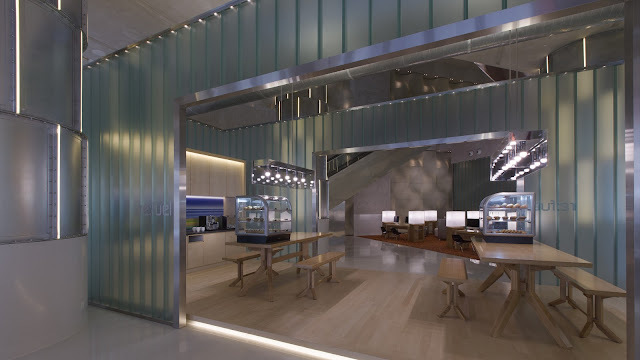 Harried travellers who are hard-pressed for time can grab a quick sandwich, a cuppa or a salad from Aloft's 24/7 'grab & go' deli known as "re:fuel". The simple official opening ceremony saw the relevant head honchos putting together pieces of the hotel's QR code before the press conference was held at the Ballroom. A hotel tour soon followed where we had a chance to view the "splash" (swimming pool), the Polynesian themed Mai Bar on the rooftop and some of the guestrooms. 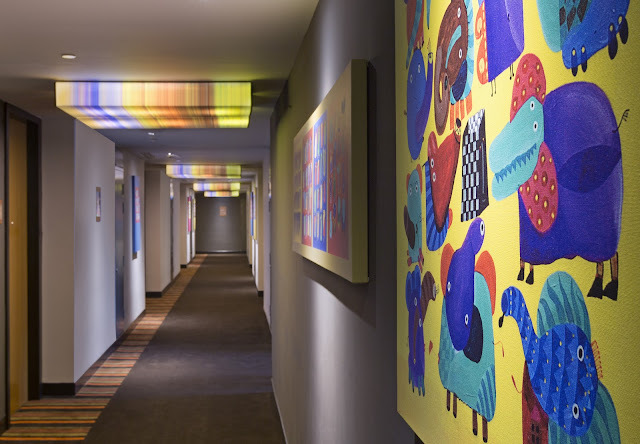 Vibrant stripe coloured lights and whimsical artworks by Yusof Gajah lend a breezy feel to the corridors whilst comic renderings by Antares (Kit Lee), Lam Le Siang and Tony Twigg bring a smile and a chuckle to those bedding down for the night in the pragmatically furnished guest rooms. By the way, forget about extra bed...none's available here! Kids sharing parents' room will have to make do with "camp Aloft" - adventure-style camp bed in a bag that's guaranteed not to cause any whinging. 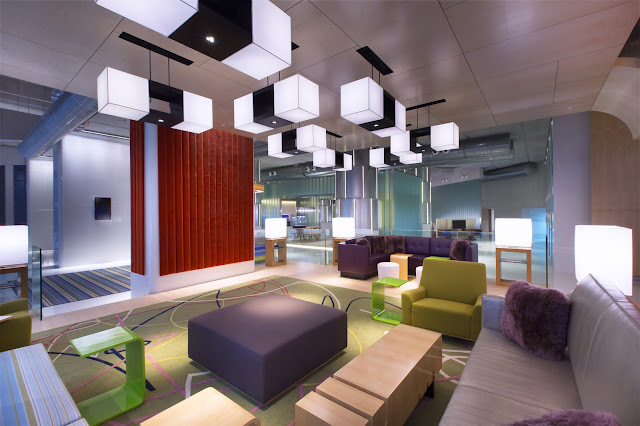 WiFi is available FOC throughout the hotel and guests can access the Internet and their emails via computer terminals set-up at the "in touch" lounge - a signature feature of all Starwood hotels. BnF (that's beverage & food to you n me) takes centrestage at The Nook which kinda reminds me of a groovy Austin Powers pad: lime green horse hair carpeting, padded booth seats with high stools, freeform and sparkly rotund chandeliers and a sleek glass accented, minimalist buffet line. 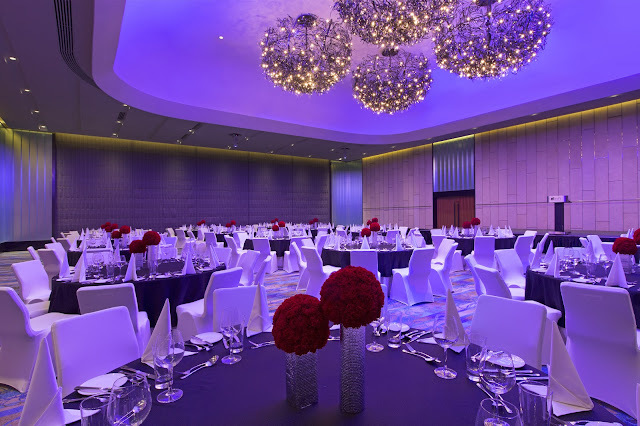 Event space is known as "tactic" where several multi-purposed function room and a Grand Ballroom are available to suit a variety of special events: meetings, trainings, workshops, weddings, launches, etc. 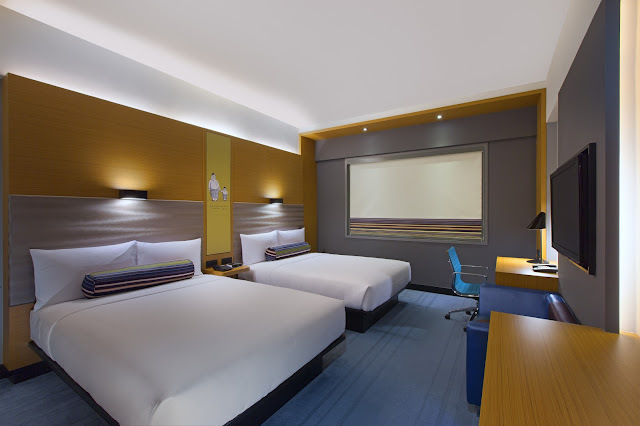 To mark the opening of the 482-room Aloft KL Sentral, special rates starting from RM328+ per night for a Loft room is now available. Rate inclusive of welcome gift and a complimentary cocktail at "w xyz" or Mai Bar. What kind of tea would go well with this luscious chocolate cake? This and other mind-boggling questions were the hot topic at the recent Dilmah Tea workshop held at the Hub @ Le Meridien KL one fine Saturday morning. Chang Yeow Lim, Food Service Manager from Dankoff Coffee Specialist Sdn Bhd (Dilmah's local rep) shared with us some interesting facts about the tea brand e.g. how the name Dilmah is derived from the founder - Merrill J Fernando's sons' names, how his family has devoted 56 years to the tea business (from planting, processing and marketing to changing the lives of their workers and sustaining the area on which Dilmah teas are grown) and the upcoming trend of matching tea with food. Within the short span of time when Chang held court, we learned that Dilmah teas are hand-picked, powered by an almost all-female workforce that selects only "two leaves and the bud" from the tea plants. Only the finest teas boast such quality hence it is unsurprising that Dilmah commands good prices for the tea that they produce. The Dilmah team also brought along a brass samovar - a unique heated metal contraption that's traditionally used to heat and boil water in Russia and certain Eastern European countries for the tea-making demonstration. Aided by the company trainer and resident mixologist Cheryl Lee, we were treated to creative concoctions of mocktails using Dilmah tea such as Moroccan Mint and Lapsang Souchong mixed with Monin flavoured syrups. It was fascinating watching them brew and steep the tea. Some of us (yours truly included) were itching to own the nice implements such as Dilmah's very own tea timer and specially designed tea glass. "Allow one teaspoon of black tea per person and one for the pot. Once boiled water is poured in, let the tea steep for a minute before stirring. Then the pot should be left for 4 more minutes before serving. For tea bags, brewing time is only about 2 minutes." He also reminded us not to squeeze the tea bag if we're using them to brew tea as the tea's best flavour would have leached into the water on its own accord. It is also advisable to remove the tea bag once the time is up. "Green tea also takes less time to brew - use boiled water that's around 70 degrees Celsius and let it steep for 2 minutes." The hotel provided us with a sugar rush to complement our tea-tasting session. Earlier I didn't take to the Moroccan Mint mocktail as I found the minty overtone too strong for my liking but when partaken hot, the refreshing tea really complemented the rich chocolate cake, macarons and little muffins. We also had a chance to try Dilmah's Pure Chamomile Flowers, Earl Grey, Green Tea with Jasmine, Natural Ceylon Ginger Tea and Natural Rosehip with Hibiscus infusions, testing them with the different sweet offerings. If there's one driving force that should inspire you to choose Dilmah over its competition, it should be the company's admirable and untiring efforts in doing away with the middlemen and reinvesting the fruits of its labour back to the tea plantations so that their workers and economy of Sri Lanka get to share in the spoils of fair trade. Now won't you join me and drink a 'tea-rific' toast to such ethical practices? In Hong Kong, the taste of success is defined by the dish "yue chi lou farn" - braised shark's fin with rice - a colloquialism among punters who would treat themselves to the luxurious delicacy when they strike it rich in the stock or property market or enjoy an unexpected windfall. Taking a tongue-in-cheek approach to the popular sybolism, Chef Thian Taik Yong decided to entice local diners and Di Wei patrons with "pau yue lou farn" - braised abalone and fish maw served with fried rice throughout March. Priced at RM58.80++ per set, the exquisitely prepared dish takes him three hours to prepare using canned Australian abalone and imported dried fish maw. "I decided to substitute abalone for shark's fin to give the dish a fresh twist," said the boyish Chef Thian. 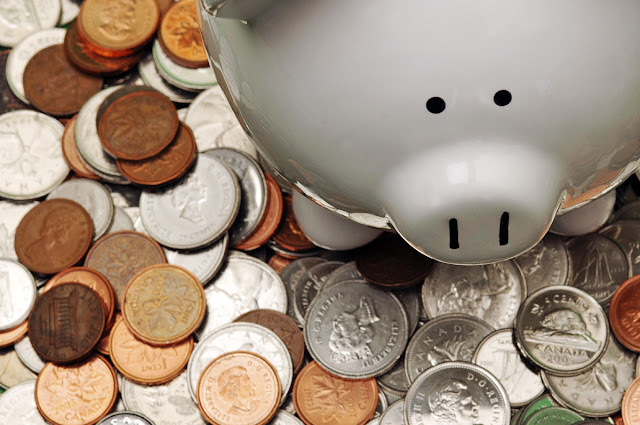 "It's also more eco-friendly yet retains that touch of luxury." Instead of plain rice, the chef served fried rice cooked with egg white; the portion enveloped in a egg yolk crepe. Dried scallop lends the fluffy grains extra flavour and depth. The accompanying dish of braised abalone and fish maw provides the necessary moisture from its full-bodied, slightly unctuous abalone sauce. Smooth and succulent, the fish maw and abalone went swimmingly well with some plump "tau kan" (compressed slices of layered beancurd sheets) which had soaked up the irresistible sauce. A side dish of lightly sauteed iceberg lettuce lends healthy balance to the indulgent meal. For the month of April, brace yourself for a grilling good time courtesy of BBQ chef Lai Yoke Wei. You'd go quackers over his creation of Honey Apple Cider Crispy Roast Duck. His signature Roast Duck has quite a following and this latest variant will reinforce his expertise in the roasting realm. Prime ducks weighing about 2.3-2.5kg each are marinated overnight in Lai's distinct concoction of blended green apple, honey and apple cider beer. Then the ducks are hung up to dry before roasting. During the air-drying process, the ducks are basted with maltose. Then the skin is liberally pricked with a knife and seasoned to taste before the ducks are roasted until the skin takes on a burnished sheen and crackling crisp. The tantalising apple honey sauce is poured into the dish before the duck is placed on top prior to serving, to ensure the duck remains crispy when it reaches the dining table. Prior booking is required should you wish to sample this delectable speciality. For reservations, please call Di Wei Restaurant, tel: 03-5565 1388. Address: Empire Hotel Subang, Jalan SS15/1 Subang Jaya, Selangor.